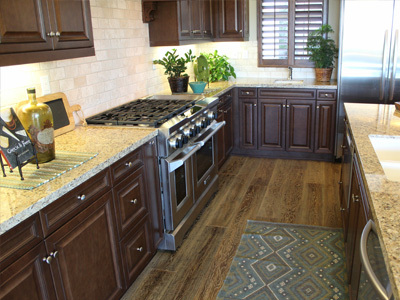 We make your design dreams come true! 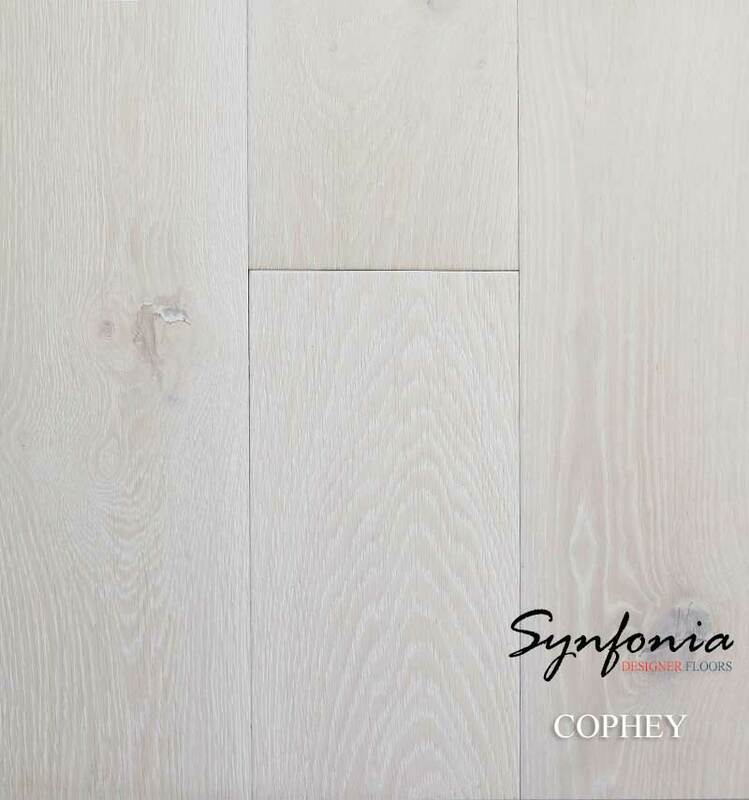 Unlike many others, Synfonia Floors’ industry reputation comes from products we specifically hand pick from our supplier partners. 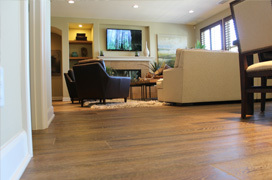 Our floors are made from a special grade of lumber. 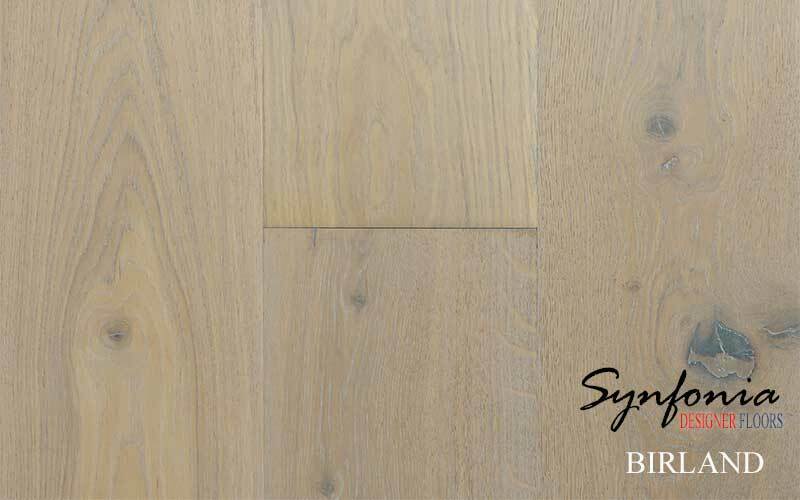 In particular, our European White Oak species are made per our milling and cust specifications to create a unique natural look that cannot be achieved in any other way. 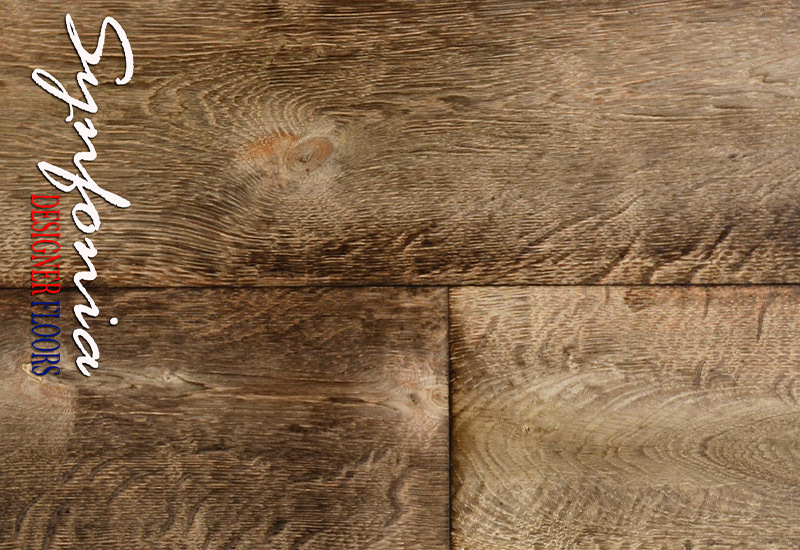 The wonderful grain pattern in our Ellington Collection IV and Copland Collection VI profusely portray the beauty of natural wood products. 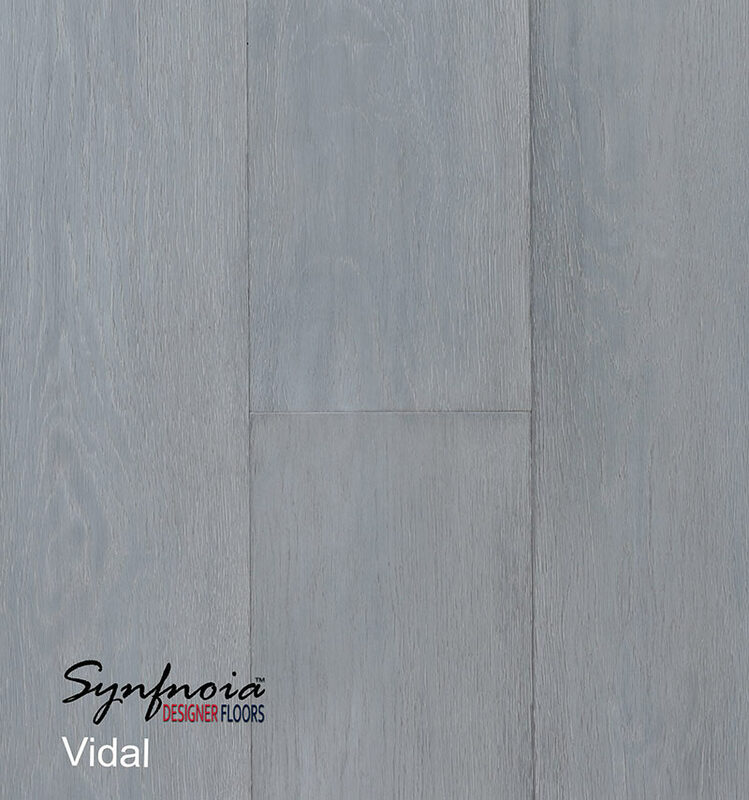 The color and character variations created in our factory are truly unsurmountable. 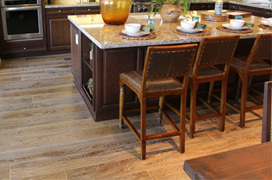 We strive to provide our customers with best support and services possible. 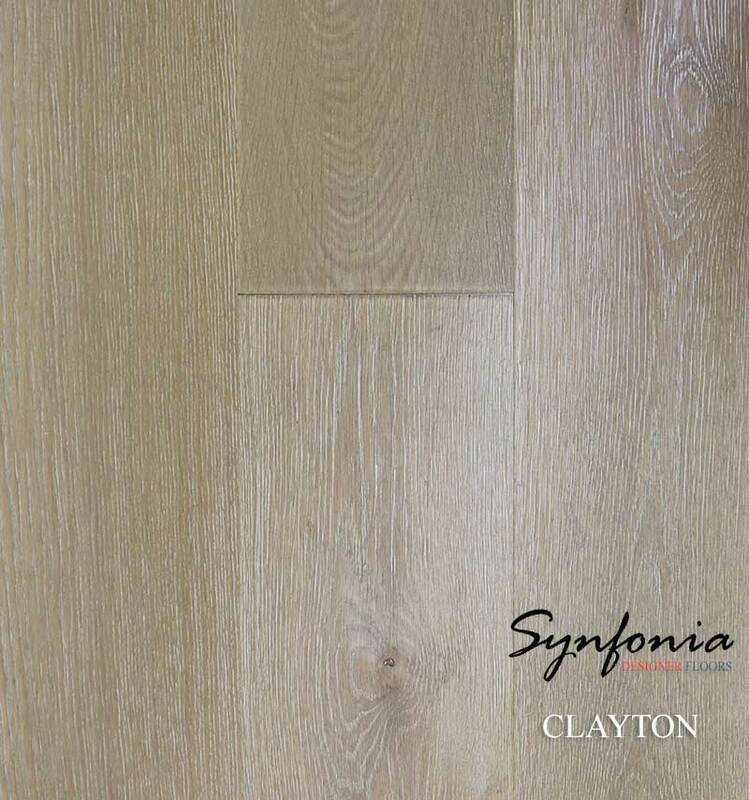 Synfonia Floors designs and manufactures products that are distinctively unique whether thay are to be installed in homes or commercial and business establishments. 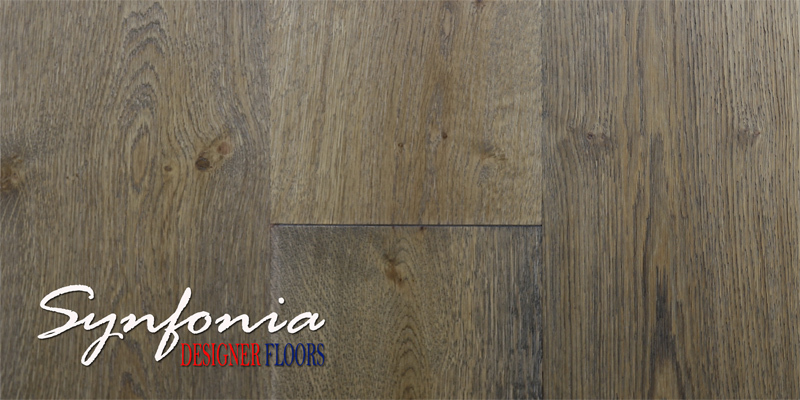 Our floors are elegant, sophisticated, unique and fashionable, with a compelling personal touch that makes them suitable for every occasion. 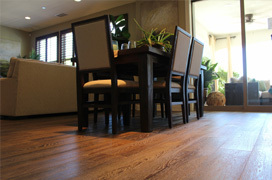 Creating custom finish floors are the result of many years of experience working with nature. 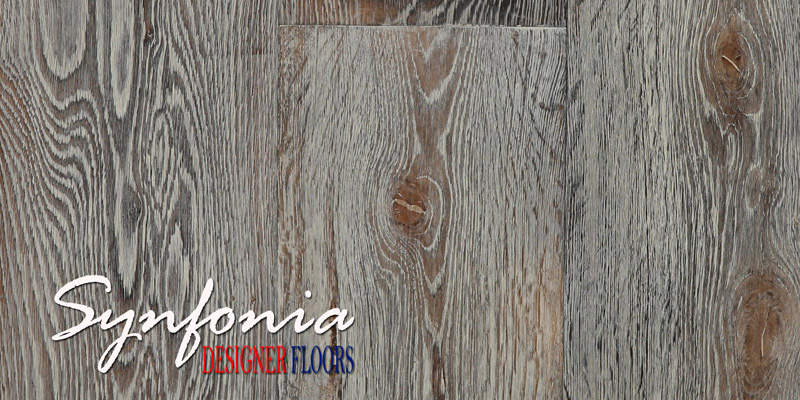 We can produce new hardwood floors that exhibit the look and feel of a classic antique floors, or the modern look of today's contemporary and transitional life styles. 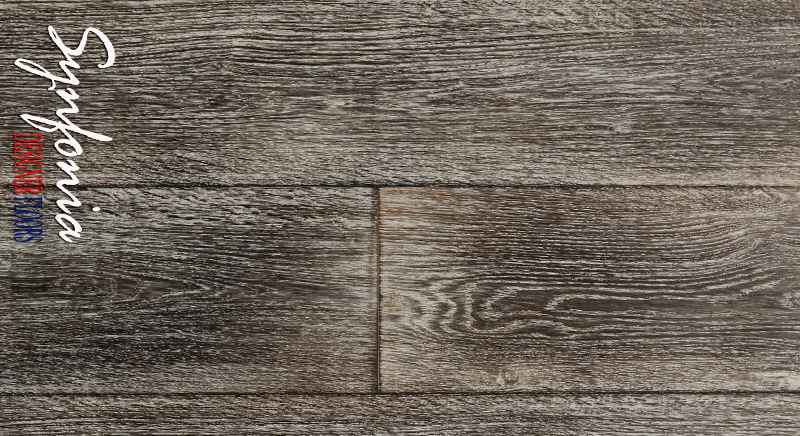 Our custom crafted solutions will have their own distinct character from grain, knots, saw marks, to mineral veines to finishing touches such as distress, stain, colors and sheen, making them abundantly notable any and every where they are installed. 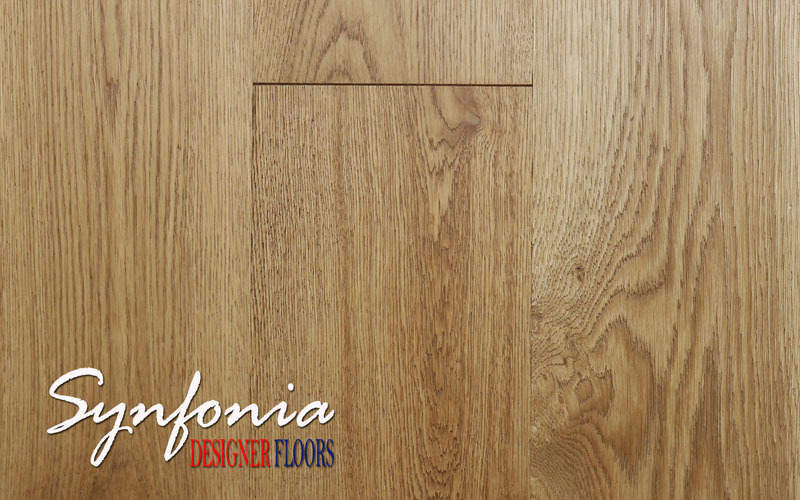 Aging Oak floors is not a new idea, but at Synfonia Floors, we make the task of aging less onerous, far easier and much more environmentally friendly. 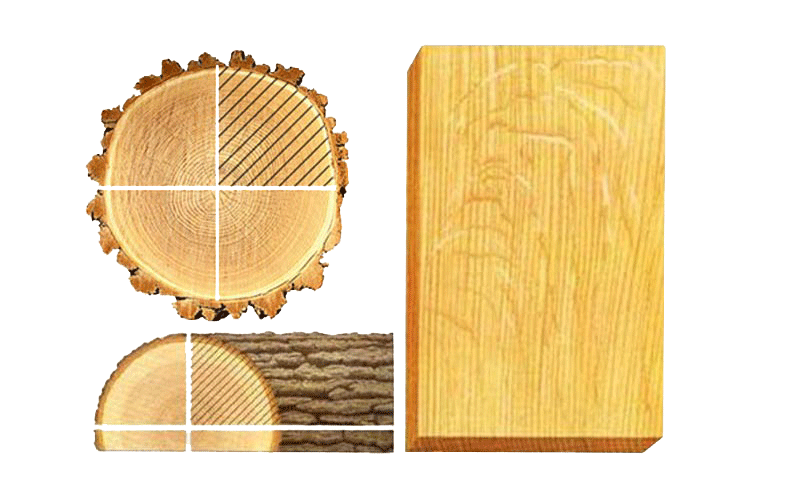 Always a delicate process to create the desired aged look. 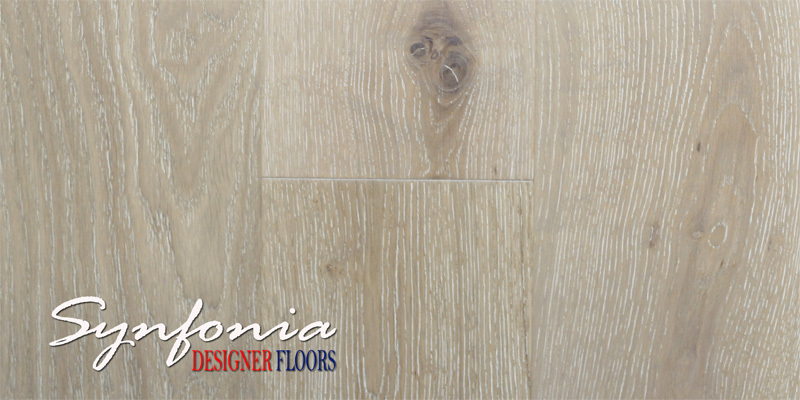 Synfonia Floors offers the custom finishing solution you have been looking for. 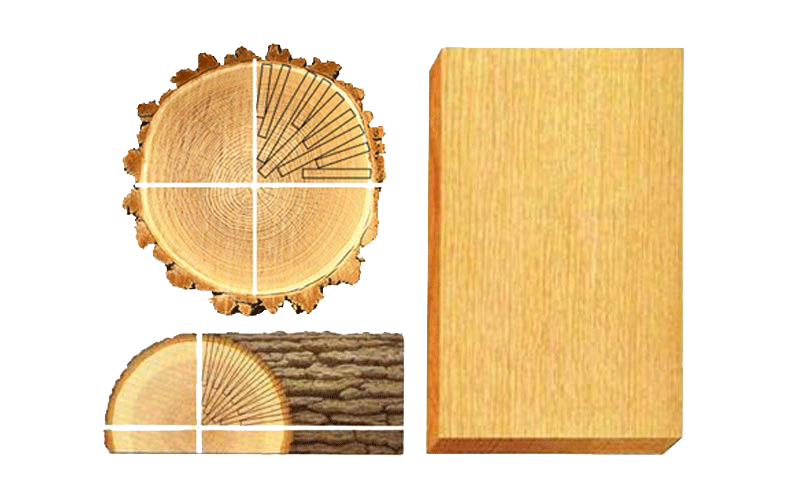 Our quality craftsmanship will help you create masterpieces that will last for generations to come. 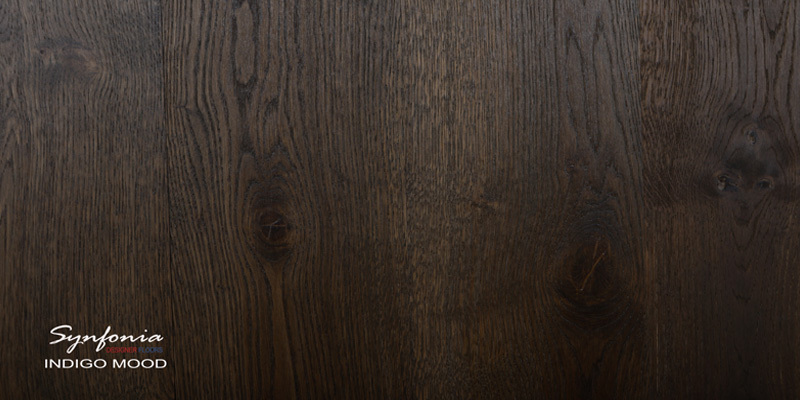 Wire brushing adds beautiful texture to a floor while maintaining a smooth look by removing soft grain from the growth rings and leaving the heart of the wood exposed. 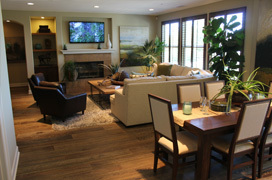 Designers will often fill gaps with selected colors to produce characteristics that are truly eye catching. 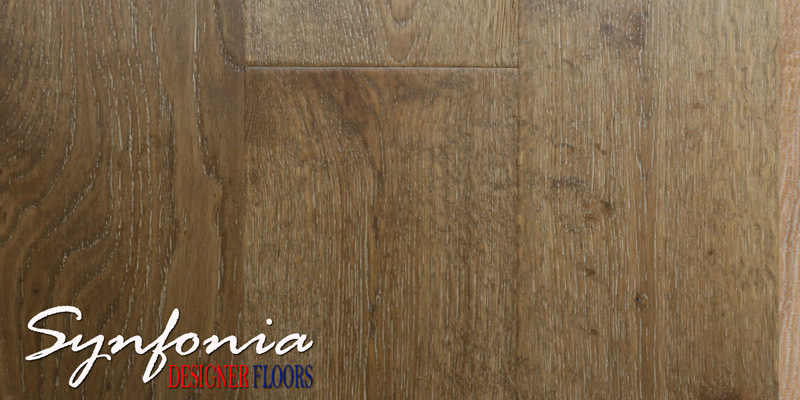 This process creates floors that are far more durable while masking the effects of agaes and wear and tear. 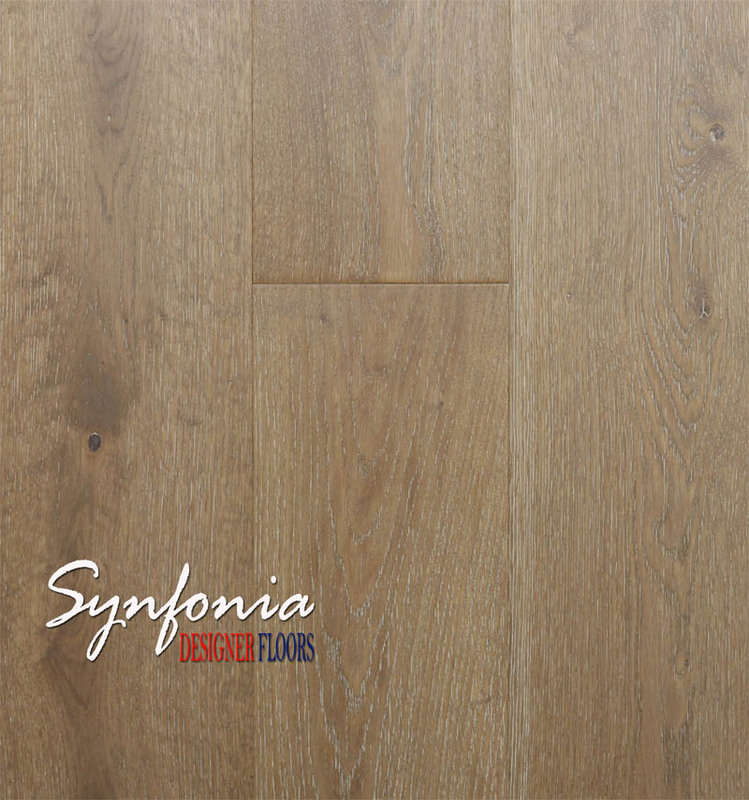 Synfonia Floors' wire brushed products are available in a variety of species in both engineered and solid planks. 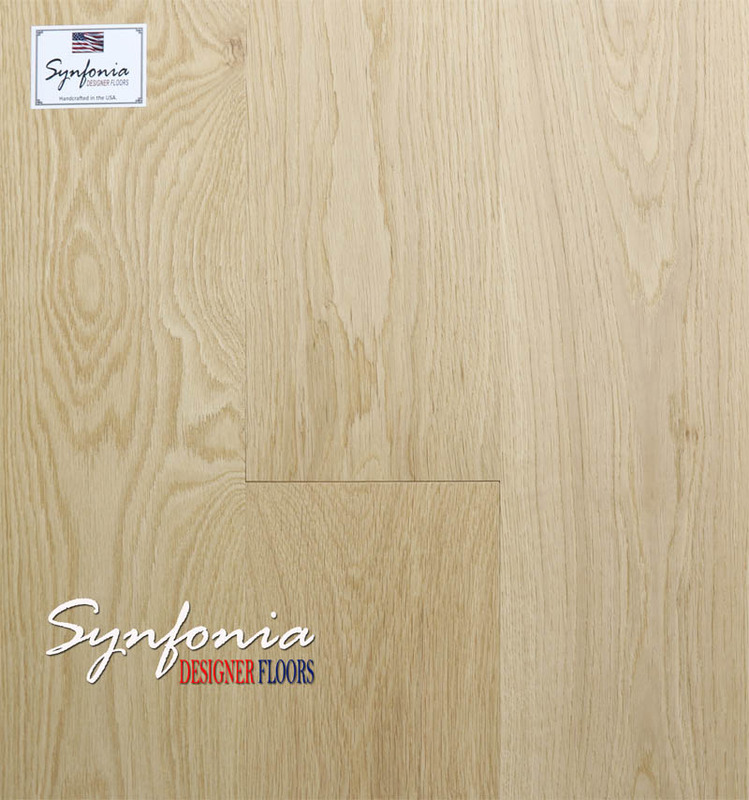 Synfonia Floors can work with you create your desired saw marks on any wood species of your choice. 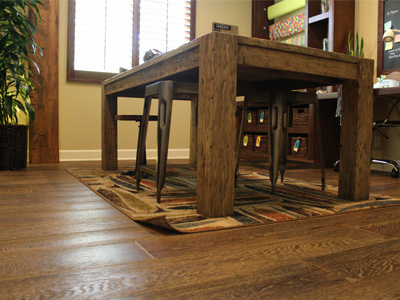 Call us for more custom choices. 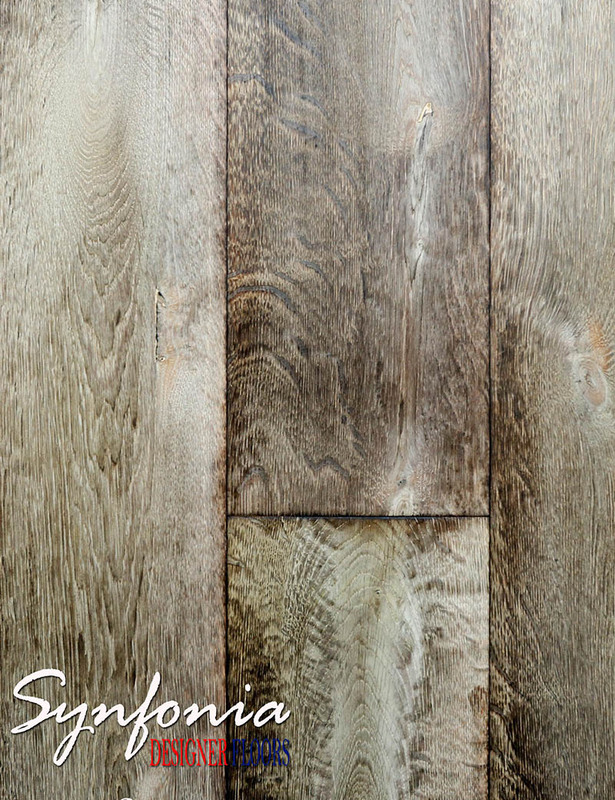 Fumed or smoked oak wood floors are very popular with interior designers, and are used throughout the industry. 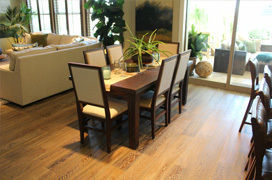 Oak floors can be treated to change color. 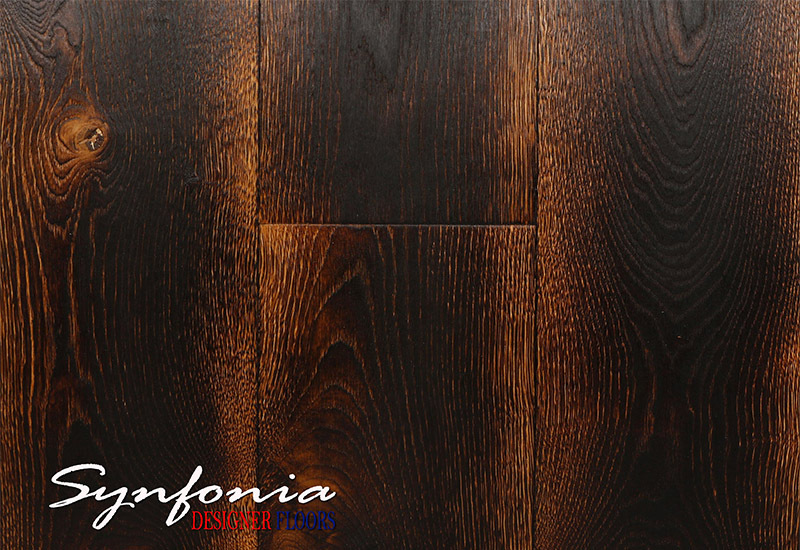 This is achieved by treating the wood to gain its color characteristics. 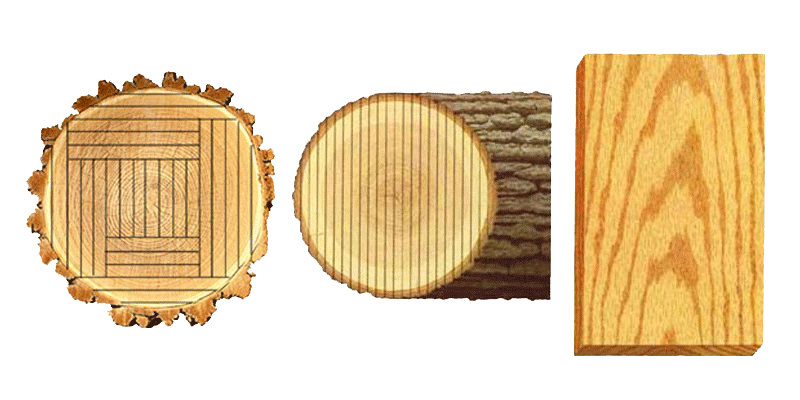 The change of color depends on how long the wood is exposed to the fume. 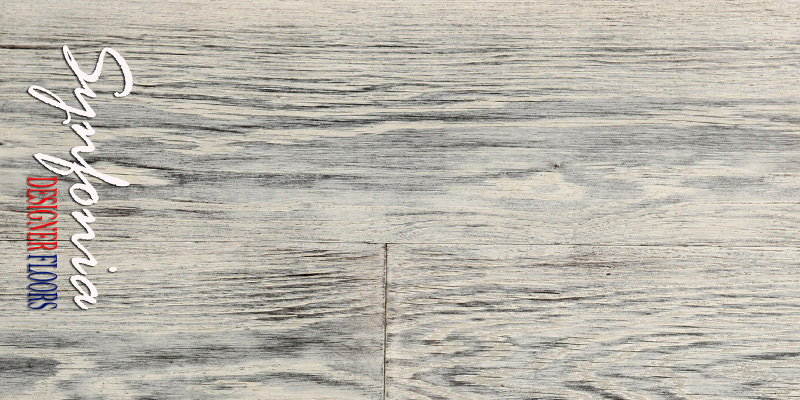 The longer exposure, the darker wood will become. 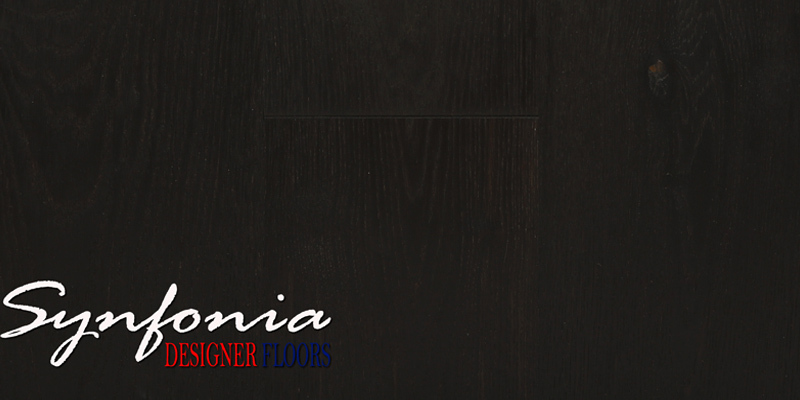 Your desired color can range from rich brown to almost black. 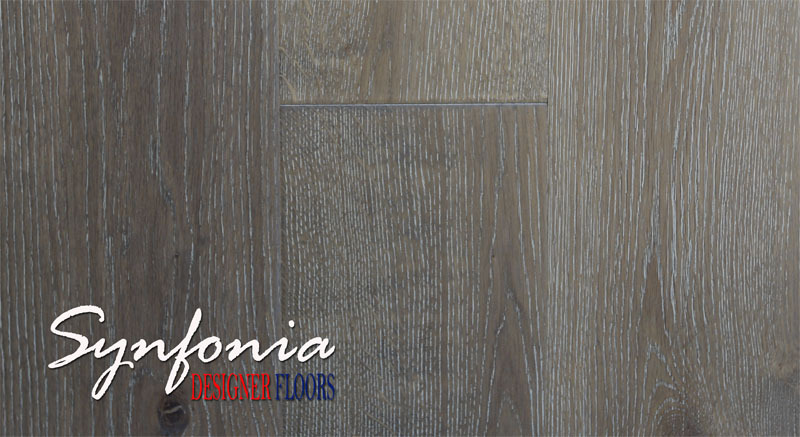 Synfonia Floors can help you find your desired finish color. 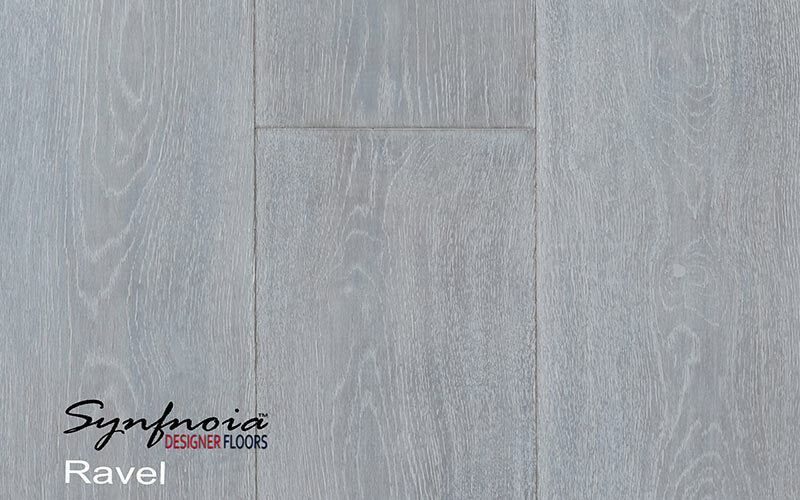 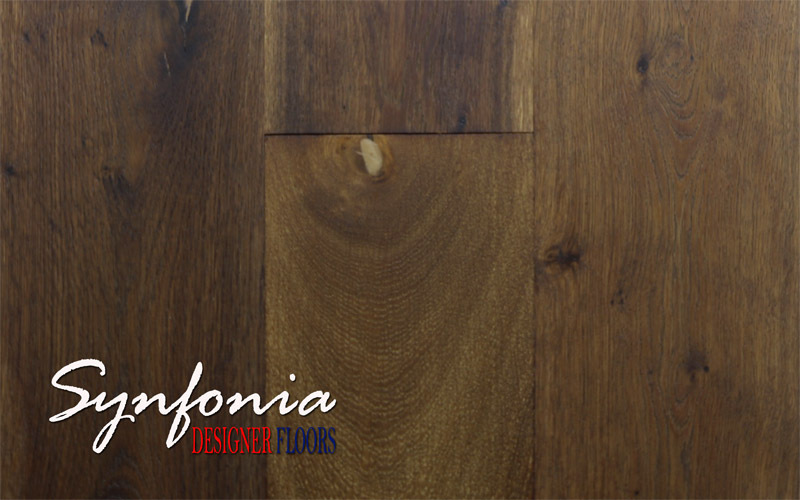 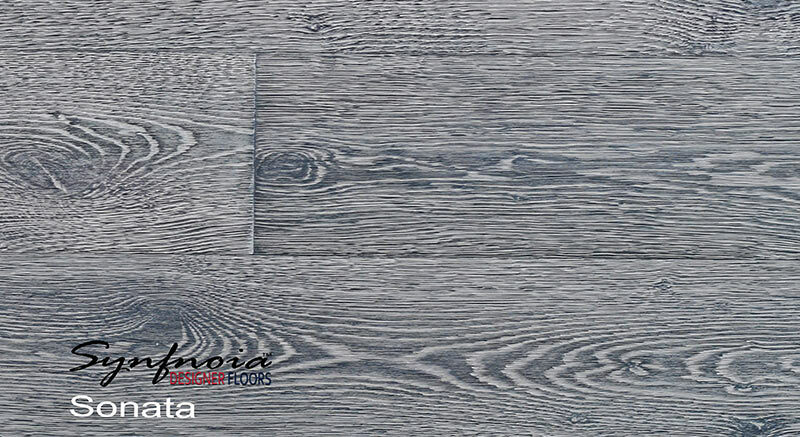 Synfonia Floors offers stunning species of unfinished hardwood products. 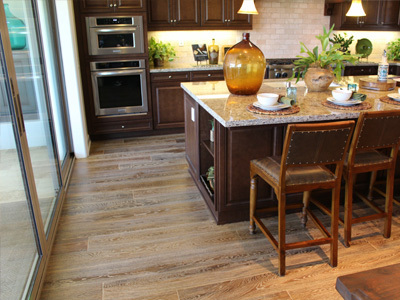 Please review your project with us and provide your exact specifications. 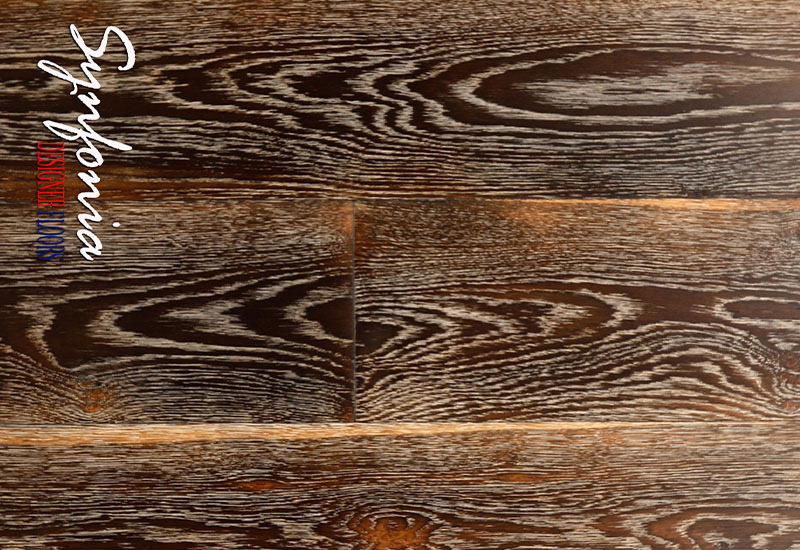 Let us go to work for you. 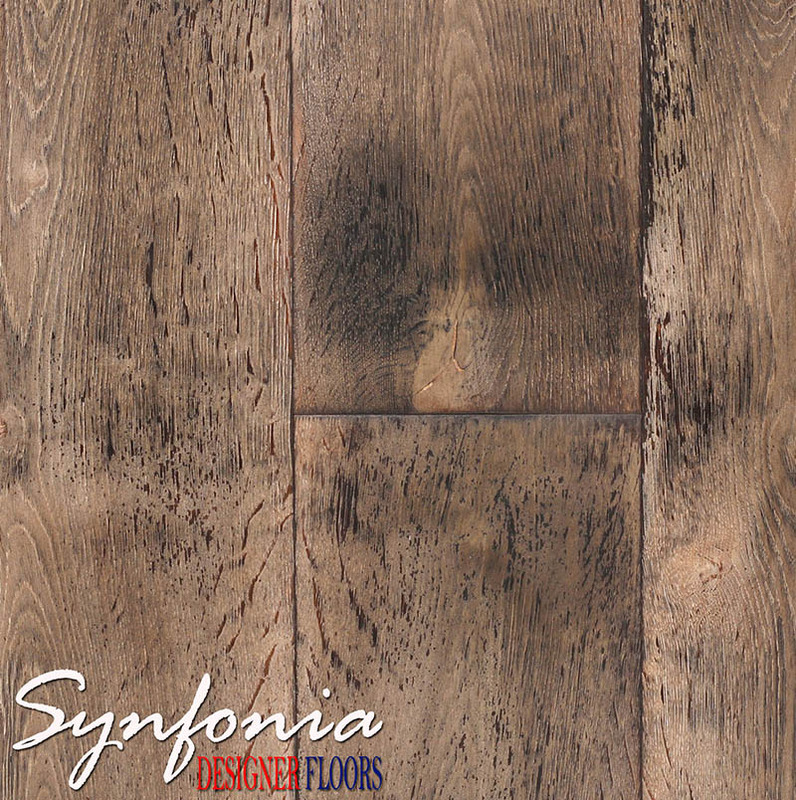 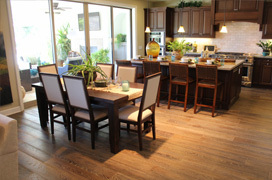 Distressed wood flooring from Synfonia Floors adds a unique and rustic look to your design. 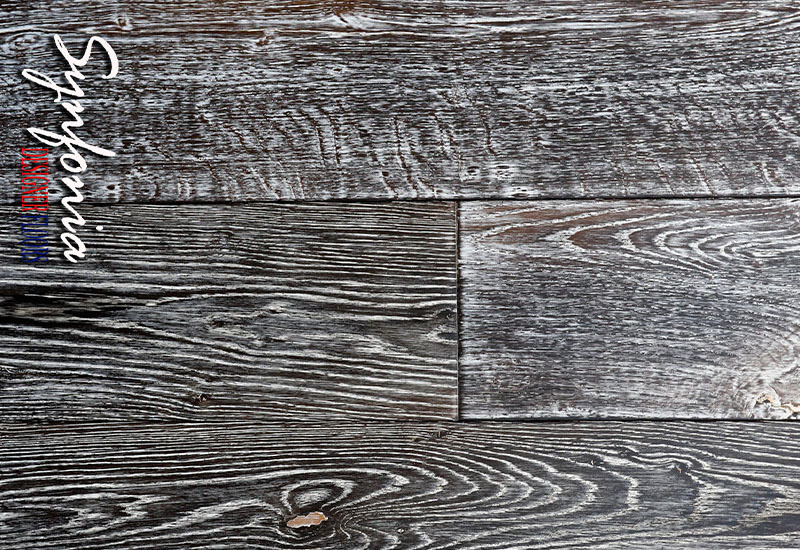 Products that are hand-scraped, foot worn and show other distinctive marks of againg can be produced using uniquely defined techniques that bring the classic look of aged floors to freshly created products.